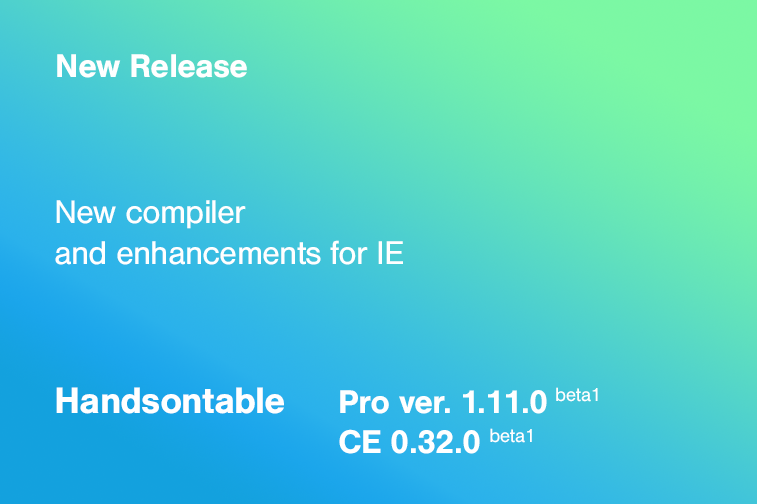 We are happy to announce that today we have released Handsontable PRO 1.11.0-beta1 (Community Edition: 0.32.0-beta1). Learn more about what we have delivered within this version. Traceur is not actively maintained anymore. We had to create workarounds in order to make our wrappers working. We spent 8 straight weeks upgrading Handsontable Pro/CE and the hot-builder engine to work with the new transpiler. The output code is now 47KB larger but the performance and readability remained intact. What’s most important, we can now use all the ES2015 features except Generators. We can debug the code faster thanks to sourceMaps (yep, we didn’t have that comfort before in our version of Traceur!) and get a better standardized code. We expect to be able to easily implement new features of ES2015+ in the future. Also, our wrappers for React, Vue.js and Angular will be better integrated with commonJS, therefore building a new app for Node using Handsontable should now be a smooth experience. The Bootstrap CSS files were merged with the default CSS file. Some global variables were reorganized and/or removed. Fixed a problem, where the ESC key did not work for the filtering menu. In addition to the switch from Traceur to Babel, we adjusted the naming convention of global variables in validators, renderers, cell types, plugins and helpers. Make sure that your code is up to date with these changes. Sometimes you need a punch in the face to start doing things properly. For us, the hit came from Alex from GrooveHQ ,who wrote a story about his angry customer who complained about the slow development of the app. The thing is that the development wasn’t slow at all. It was the lack of information about the progress that caused this situation. I think that it is high time to admit that we neglected that part of Handsontable development. We focused too much on the technical part of the business while doing nothing to communicate changes to users. From now on we will publish a new blog post after each release of Handsontable, regardless of whether it is a major, minor or a patch change. Also, starting from the end of June, we will send the updates via email to all existing customers of Handsontable Pro. Apart from that, you will always find fresh updates on our Twitter account.